The launch of the site generated a significant amount of early attention. During the site’s first eight days (Sept. 22-30, 2011) 174 petitions collected the minimum number of signatures to be archived on the site. Of those first petitions, 16 were about immigration, while 13 involved requests to legalize marijuana. However, the number of petitions slowed quickly after this initial surge. By December 2011, the number of petitions per month had fallen to 30 – and the site would not exceed 50 petitions in any calendar month until nearly a year later. Interest in the site increased dramatically starting in late 2012. From November 2012 through January 2013, there were a total of 804 petitions – an average of 268 per month. This increase was driven in large part by reactions to two major events. First, just days after President Obama won re-election in November 2012, a petition was created to request the White House allow the state of Texas to “peacefully” secede from the United States and form its own government. Similar petitions were soon created calling for each of the 50 states in the U.S. to either secede from the Union or have a vote on secession. On the week of Nov. 7-14 alone, there were 74 different petitions about secession. A few states, such as Ohio and Virginia, had as many as three separate petitions with similar aims. Several of these pro-secession petitions reached the signature threshold for a White House response, which was issued on Jan. 11, 2013. The matter of secession gained so much attention that it sparked a backlash on the site: Eight different petitions were created to oppose the secession movement, with three of those calling on the White House to either strip the citizenship of, or deport, all signatories of the original secession petitions. Following the rush of petitions that ended in early 2013, the number of petitions per month has generally remained stable. From February 2013 through June 2016, the site has averaged 82 petitions a month with relatively small fluctuations. During that time, only three months have exceeded 115 petitions and only three months have had less than 55. Unlike the earlier periods, the level of activity has not spiked dramatically following major events, suggesting the public has become less likely to view the site as a meaningful way to be heard in regards to breaking news. In the nearly five years the site has existed, the share of petitions receiving the signatures needed to receive an official White House response has decreased dramatically. However, most of those decreases can be attributed to the two occasions when the White House increased the signature thresholds. During the first 12 days of the site’s existence – when “We the People” was receiving significant media attention and the signature threshold was just 5,000 signatures ­many petitions met that threshold. Out of the 186 archived petitions posted between Sept. 22 and Oct. 3, 2011, 81 of them (44%) reached the 5,000 signature goal. 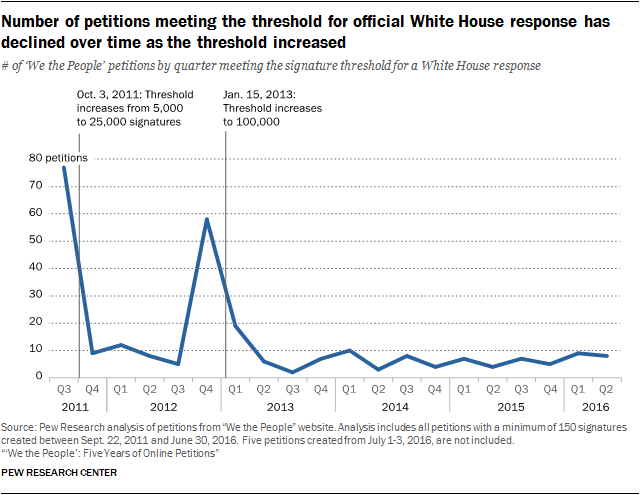 On Oct. 3, the White House increased the signature threshold to 25,000, and the share of petitions meeting that total decreased significantly. From that day through January 15, 2013, some 1,098 petitions were posted on the site that were included in the archive. Of those, just 9% – 100 in total – reached the 25,000 signature threshold. The White House’s final increase in the signature threshold (to 100,000) took effect on Jan. 15, 2013. From that point through July 3, 2016, just 2% of petitions reached the signature threshold (87 out of 3,515). 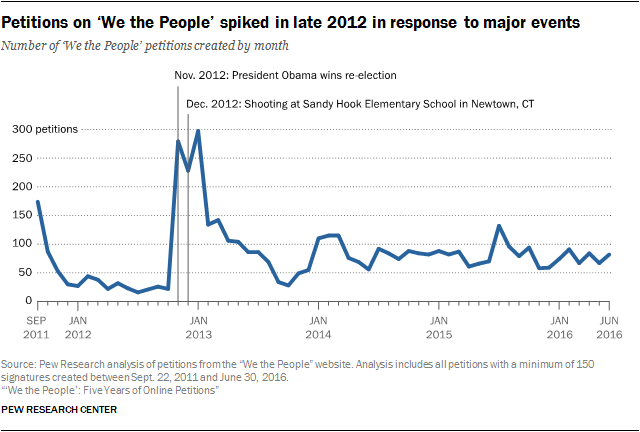 Put somewhat differently, in the nearly five years analyzed by Pew Research Center, a total of 268 petitions reached the signature threshold needed to receive an official White House response – and 30% of those cases occurred during the first 12 days of the site’s existence when the threshold was set at 5,000 signatures.